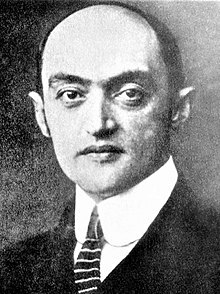 Joseph Aloïs Schumpeter (German: [ˈʃʊmpeːtɐ]; 8 February 1883 – 8 January 1950) was an Austrian political economist. Born in Moravia, he briefly served as Finance Minister of Austria in 1919. In 1932, he became a professor at Harvard University where he remained until the end of his career, eventually obtaining U.S. citizenship. One of the most influential economists of the 20th century, Schumpeter popularized the term "creative destruction" in economics. Schumpeter claimed that he had set himself three goals in life: to be the greatest economist in the world, to be the best horseman in all of Austria and the greatest lover in all of Vienna. He said he had reached two of his goals, but he never said which two, although he is reported to have said that there were too many fine horsemen in Austria for him to succeed in all his aspirations. Schumpeter was born in Triesch, Habsburg Moravia (now Třešť in the Czech Republic, then part of Austria-Hungary) in 1883 to Catholic German-speaking parents. Both of his grandmothers were Czech. Schumpeter did not acknowledge his Czech ancestry; he considered himself an ethnic German. His father owned a factory, but he died when Joseph was only four years old. In 1893, Joseph and his mother moved to Vienna. Schumpeter was a loyal supporter of Franz Joseph I of Austria. After attending school at the Theresianum, Schumpeter began his career studying law at the University of Vienna under the Austrian capital theorist Eugen von Böhm-Bawerk, taking his PhD in 1906. In 1909, after some study trips, he became a professor of economics and government at the University of Czernowitz. In 1911, he joined the University of Graz, where he remained until World War I. In 1918, Schumpeter was a member of the Socialization Commission established by the Council of the People's Deputies in Germany. In March 1919, he was invited to take office as Minister of Finance in the Republic of German-Austria. He proposed a capital levy as a way to tackle the war debt and opposed the socialization of the Alpine Mountain plant. In 1921, he became president of the private Biedermann Bank. He was also a board member at the Kaufmann Bank. Problems at those banks left Schumpeter in debt. His resignation was a condition of the takeover of the Biedermann Bank in September 1924. From 1925 to 1932, Schumpeter held a chair at the University of Bonn, Germany. He lectured at Harvard in 1927–1928 and 1930. In 1931, he was a visiting professor at The Tokyo College of Commerce. In 1932, Schumpeter moved to the United States, and soon began what would become extensive efforts to help central European economist colleagues displaced by Nazism. Schumpeter also became known for his opposition to Marxism and socialism that he thought would lead to dictatorship, and even criticized President Franklin Roosevelt's New Deal. In 1939, Schumpeter became a US citizen. In the beginning of World War II, the FBI investigated him and his wife (a prominent scholar of Japanese economics) for pro-Nazi leanings, but found no evidence of Nazi sympathies. At Harvard, Schumpeter was considered a memorable character, erudite and even showy in the classroom. He became known for his heavy teaching load and his personal and painstaking interest in his students. He served as the faculty advisor of the Graduate Economics Club and organized private seminars and discussion groups. Some colleagues thought his views outdated by Keynesianism which was fashionable; others resented his criticisms, particularly of their failure to offer an assistant professorship to Paul Samuelson, but recanted when they thought him likely to accept a position at Yale University. This period of his life was characterized by hard work and comparatively little recognition of his massive 2-volume book Business Cycles. However, the Schumpeters persevered, and in 1942 published what became the most popular of all his works, Capitalism, Socialism and Democracy, reprinted many times and in many languages in the following decades, as well as cited thousands of times. The source of Joseph Schumpeter's dynamic, change-oriented, and innovation-based economics was the Historical School of economics. Although his writings could be critical of the School, Schumpeter's work on the role of innovation and entrepreneurship can be seen as a continuation of ideas originated by the Historical School, especially the work of Gustav von Schmoller and Werner Sombart. According to Christopher Freeman (2009), a scholar who devoted much time researching Schumpeter's work: "the central point of his whole life work [is]: that capitalism can only be understood as an evolutionary process of continuous innovation and 'creative destruction'". Schumpeter's scholarship is apparent in his posthumous History of Economic Analysis, although some of his judgments seem idiosyncratic and sometimes cavalier. For instance, Schumpeter thought that the greatest 18th century economist was Turgot, not Adam Smith, as many consider, and he considered Léon Walras to be the "greatest of all economists", beside whom other economists' theories were "like inadequate attempts to catch some particular aspects of Walrasian truth". Schumpeter criticized John Maynard Keynes and David Ricardo for the "Ricardian vice." According to Schumpeter, Ricardo and Keynes reasoned in terms of abstract models, where they would freeze all but a few variables. Then they could argue that one caused the other in a simple monotonic fashion. This led to the belief that one could easily deduce policy conclusions directly from a highly abstract theoretical model. In this book, Joseph Schumpeter recognized the implication of a gold monetary standard compared to a fiat monetary standard. In History of Economic Analysis, Schumpeter stated the following: "An 'automatic' gold currency is part and parcel of a laissez-faire and free-trade economy. It links every nation's money rates and price levels with the money-rates and price levels of all the other nations that are 'on gold.' However, gold is extremely sensitive to government expenditure and even to attitudes or policies that do not involve expenditure directly, for example, to foreign policy, to certain policies of taxation, and, in general, to precisely all those policies that violate the principles of [classical] liberalism. This is the reason why gold is so unpopular now and also why it was so popular in a bourgeois era." Schumpeter's relationships with the ideas of other economists were quite complex in his most important contributions to economic analysis – the theory of business cycles and development. Following neither Walras nor Keynes, Schumpeter starts in The Theory of Economic Development with a treatise of circular flow which, excluding any innovations and innovative activities, leads to a stationary state. The stationary state is, according to Schumpeter, described by Walrasian equilibrium. The hero of his story is the entrepreneur. The entrepreneur disturbs this equilibrium and is the prime cause of economic development, which proceeds in cyclic fashion along several time scales. In fashioning this theory connecting innovations, cycles, and development, Schumpeter kept alive the Russian Nikolai Kondratiev's ideas on 50-year cycles, Kondratiev waves. Schumpeter suggested a model in which the four main cycles, Kondratiev (54 years), Kuznets (18 years), Juglar (9 years) and Kitchin (about 4 years) can be added together to form a composite waveform. Actually there was considerable professional rivalry between Schumpeter and Kuznets. The wave form suggested here did not include the Kuznets Cycle simply because Schumpeter did not recognize it as a valid cycle. [clarification needed] See "business cycle" for further information. A Kondratiev wave could consist of three lower degree Kuznets waves. Each Kuznets wave could, itself, be made up of two Juglar waves. Similarly two (or three) Kitchin waves could form a higher degree Juglar wave. If each of these were in phase, more importantly if the downward arc of each was simultaneous so that the nadir of each was coincident, it would explain disastrous slumps and consequent depressions. As far as the segmentation of the Kondratiev Wave, Schumpeter never proposed such a fixed model. He saw these cycles varying in time – although in a tight time frame by coincidence – and for each to serve a specific purpose. In Schumpeter's theory, Walrasian equilibrium is not adequate to capture the key mechanisms of economic development. Schumpeter also thought that the institution enabling the entrepreneur to buy the resources needed to realize his vision was a well-developed capitalist financial system, including a whole range of institutions for granting credit. One could divide economists among (1) those who emphasized "real" analysis and regarded money as merely a "veil" and (2) those who thought monetary institutions are important and money could be a separate driving force. Both Schumpeter and Keynes were among the latter. Schumpeter's most popular book in English is probably Capitalism, Socialism and Democracy. While he agrees with Karl Marx that capitalism will collapse and be replaced by socialism, Schumpeter predicts a different way this will come about. While Marx predicted that capitalism would be overthrown by a violent proletarian revolution, which actually occurred in the least capitalist countries, Schumpeter believed that capitalism would gradually weaken by itself and eventually collapse. Specifically, the success of capitalism would lead to corporatism and to values hostile to capitalism, especially among intellectuals. "Intellectuals" are a social class in a position to critique societal matters for which they are not directly responsible and to stand up for the interests of other classes. Intellectuals tend to have a negative outlook of capitalism, even while relying on it for prestige, because their professions rely on antagonism toward it. The growing number of people with higher education is a great advantage of capitalism, according to Schumpeter. Yet, unemployment and a lack of fulfilling work will cause intellectual critique, discontent and protests. Parliaments will increasingly elect social democratic parties, and democratic majorities will vote for restrictions on entrepreneurship. Increasing workers' self-management, industrial democracy and regulatory institutions would evolve non-politically into "liberal capitalism". Thus, the intellectual and social climate needed for thriving entrepreneurship will be replaced by some form of "laborism". This will exacerbate "creative destruction" (a borrowed phrase to denote an endogenous replacement of old ways of doing things by new ways), which will ultimately undermine and destroy the capitalist structure. Schumpeter emphasizes throughout this book that he is analyzing trends, not engaging in political advocacy. In the same book, Schumpeter expounded a theory of democracy which sought to challenge what he called the "classical doctrine". He disputed the idea that democracy was a process by which the electorate identified the common good, and politicians carried this out for them. He argued this was unrealistic, and that people's ignorance and superficiality meant that in fact they were largely manipulated by politicians, who set the agenda. Furthermore, he claimed that even if the common good was possible to find, it would still not make clear the means needed to reach its end, since citizens do not have the requisite knowledge to design government policy. This made a 'rule by the people' concept both unlikely and undesirable. Instead he advocated a minimalist model, much influenced by Max Weber, whereby democracy is the mechanism for competition between leaders, much like a market structure. Although periodic votes by the general public legitimize governments and keep them accountable, the policy program is very much seen as their own and not that of the people, and the participatory role for individuals is usually severely limited. Schumpeter was probably the first scholar to theorize about entrepreneurship, and the field owed much to his contributions. His fundamental theories are often referred to as Mark I and Mark II. In Mark I, Schumpeter argued that the innovation and technological change of a nation come from the entrepreneurs, or wild spirits. He coined the word Unternehmergeist, German for "entrepreneur-spirit", and asserted that "... the doing of new things or the doing of things that are already being done in a new way" stemmed directly from the efforts of entrepreneurs. As soon as we go into details and inquire into the individual items in which progress was most conspicuous, the trail leads not to the doors of those firms that work under conditions of comparatively free competition but precisely to the door of the large concerns – which, as in the case of agricultural machinery, also account for much of the progress in the competitive sector – and a shocking suspicion dawns upon us that big business may have had more to do with creating that standard of life than with keeping it down. As of 2017[update] Mark I and Mark II arguments are considered complementary. Schumpeter identified innovation as the critical dimension of economic change. He argued that economic change revolves around innovation, entrepreneurial activities, and market power. He sought to prove that innovation-originated market power can provide better results than the invisible hand and price competition. He argued that technological innovation often creates temporary monopolies, allowing abnormal profits that would soon be competed away by rivals and imitators. These temporary monopolies were necessary to provide the incentive for firms to develop new products and processes. He was married three times. His first wife was Gladys Ricarde Seaver, an Englishwoman nearly 12 years his senior (married 1907, separated 1913, divorced 1925). His best man at his wedding was his friend and Austrian jurist Hans Kelsen. His second was Anna Reisinger, 20 years his junior and daughter of the concierge of the apartment where he grew up. As a divorced man, he and his bride converted to Lutheranism in order to marry. They married in 1925, but within a year, she died in childbirth. The loss of his wife and newborn son came only weeks after Schumpeter's mother had died. In 1937, Schumpeter married the American economic historian Elizabeth Boody, who helped him popularize his work and edited what became their magnum opus, the posthumously published History of Economic Analysis. Schumpeter died in his home in Taconic, Connecticut, at the age of 66, on the night of 7 January 1950. For some time after his death, Schumpeter's views were most influential among various heterodox economists, especially European, who were interested in industrial organization, evolutionary theory, and economic development, and who tended to be on the other end of the political spectrum from Schumpeter and were also often influenced by Keynes, Karl Marx, and Thorstein Veblen. Robert Heilbroner was one of Schumpeter's most renowned pupils, who wrote extensively about him in The Worldly Philosophers. In the journal Monthly Review John Bellamy Foster wrote of that journal's founder Paul Sweezy, one of the leading Marxist economists in the United States and a graduate assistant of Schumpeter's at Harvard, that Schumpeter "played a formative role in his development as a thinker". Other outstanding students of Schumpeter's include the economists Nicholas Georgescu-Roegen and Hyman Minsky and John Kenneth Galbraith and former chairman of the Federal Reserve, Alan Greenspan. Future Nobel Laureate Robert Solow was his student at Harvard, and he expanded on Schumpeter's theory. Today, Schumpeter has a following outside standard textbook economics, in areas such as economic policy, management studies, industrial policy, and the study of innovation. Schumpeter was probably the first scholar to develop theories about entrepreneurship. For instance, the European Union's innovation program, and its main development plan, the Lisbon Strategy, are influenced by Schumpeter. The International Joseph A. Schumpeter Society awards the Schumpeter Prize. The Schumpeter School of Business and Economics opened in October 2008 at the University of Wuppertal. According to University President Professor Lambert T. Koch, "Schumpeter will not only be the name of the Faculty of Management and Economics, but this is also a research and teaching programme related to Joseph A. Schumpeter." On 17 September 2009, The Economist inaugurated a column on business and management named "Schumpeter." The publication has a history of naming columns after significant figures or symbols in the covered field, including naming its British affairs column after former editor Walter Bagehot and its European affairs column after Charlemagne. The initial Schumpeter column praised him as a "champion of innovation and entrepreneurship" whose writing showed an understanding of the benefits and dangers of business that proved to be far ahead of its time. Schumpeter, Joseph A. (1906). Über die mathematische Methode der theoretischen Ökonomie. Zeitschrift für Volkswirtschaft, Sozialpolitik und Verwaltung. Germany: Wien. OCLC 809174553. Schumpeter, Joseph A. (1907). Das Rentenprinzip in der Verteilungslehre. Germany: Jahrbuch für Gesetzgebung, Verwaltung and Volkswirtschaft im Deutschen Reich. Schumpeter, Joseph A. (1908). Das Wesen und der Hauptinhalt der theoretischen Nationalökonomie. Germany: Leipzig, Duncker & Humblot. OCLC 5455469. Schumpeter, Joseph A. (1908). Methodological Individualism. Germany. OCLC 5455469. Pdf of preface by F.A. Hayek and first eight pages. Schumpeter, Joseph A. (1909). Bemerkungen über das Zurechnungsproblem. Zeitschrift für Wolkswirtschaft, Sozialpolitik und Verwaltung. Germany: Wien. OCLC 49426617. Schumpeter, Joseph A. (1910). Marie Ésprit Léon Walras. Germany: Zeitschrift für Wolkswirtschaft, Sozialpolitik und Verwaltung. OCLC 64863803. Schumpeter, Joseph A. (1910). Über das Wesen der Wirtschaftskrisen. Zeitschrift für Wolkswirtschaft, Sozialpolitik und Verwaltung. Germany: Wien. OCLC 64863847. Schumpeter, Joseph A. (1915). Wie studiert man Sozialwissenschaft. Schriften des Sozialwissenschaftlichen Akademischen Vereins in Czernowitz, Heft II. München und Leipzig, Germany: Duncker & Humblot. OCLC 11387887. Schumpeter, Joseph A.; Opie, Redvers (1983) . The theory of economic development: an inquiry into profits, capital, credit, interest, and the business cycle. New Brunswick, New Jersey: Transaction Books. ISBN 9780878556984. Translated from the 1911 original German, Theorie der wirtschaftlichen Entwicklung. Schumpeter, Joseph A. (author); Aris, Reinhold (translator) (1954). Economic doctrine and method: an historical sketch. New York: Oxford University Press. OCLC 504289265. Translated from the 1912 original German, Epochen der dogmen – und Methodengeschichte. Pdf version. Reprinted in hardback as: Schumpeter, Joseph A. (author); Aris, Reinhold (translator) (2011). Economic doctrine and method: an historical sketch. Whitefish Montana: Literary Licensing, LLC. ISBN 9781258003425. Reprinted in paperback as: Schumpeter, Joseph A. (author); Aris, Reinhold (translator) (2012). Economic doctrine and method: an historical sketch. Mansfield Centre, Connecticut: Martino Fine Books. ISBN 9781614273370. Schumpeter, Joseph A. (1914). Das wissenschaftliche lebenswerk eugen von böhm-bawerks. Zeitschrift für Wolkswritschaft, Sozialpolitik und Verwaltung. Germany: Wien. OCLC 504214232. Schumpeter, Joseph A. (1918). The crisis of the tax state. OCLC 848977535. Schumpeter, Joseph A. (1919). The sociology of imperialisms. Germany: Archiv für Sozialwissenschaft und Sozialpolitik. Schumpeter, Joseph A. (1920). Max Weber's work. German: Der österreichische Volkswirt. Schumpeter, Joseph A. (1921). Carl Menger. Zeitschrift für Wolkswritschaft, Sozialpolitik und Verwaltung. Germany: Wien. OCLC 809174610. Schumpeter, Joseph A. (1927). Social classes in an ethnically homogeneous environment. Germany: Archiv für Sozialwissenschaft und Sozialpolitik. OCLC 232481. Schumpeter, Joseph A. (1928). Das deutsche finanzproblem. Schriftenreihe d. dt. Volkswirt. Berlin, Germany: Dt. Volkswirt. OCLC 49426617. Schumpeter, Joseph A. (2006) . Business cycles: a theoretical, historical, and statistical analysis of the capitalist process. Mansfield Centre, Connecticut: Martino Pub. ISBN 9781578985562. Schumpeter, Joseph A. (2014) . Capitalism, socialism and democracy (2nd ed.). Floyd, Virginia: Impact Books. ISBN 978-1617208652. See also the English translation: Henderson, David R.; Prime, Michael G. (Fall 1975). "Schumpeter on preserving private enterprise". History of Political Economy. 7 (3): 293–98. doi:10.1215/00182702-7-3-293. Schumpeter, Joseph A.; Crum, William Leonard (1946). Rudimentary mathematics for economists and statisticians. New York, New York London: McGraw-Hill. OCLC 1246233. Originally printed as: Schumpeter, Joseph A. (June 1948). "There is still time to stop inflation". The Nation's Business. United States Chamber of Commerce. 6: 33–35. Archived from the original on 2014-11-29. Continued on pp. 88–91. Schumpeter, Joseph A. (1951). Ten great economists: from Marx to Keynes. New York Oxford: Oxford University Press. OCLC 166951. Reprinted as: Schumpeter, Joseph A. (1965). Ten great economists: from Marx to Keynes. New York Oxford: Oxford University Press. OCLC 894563181. Reprinted as: Schumpeter, Joseph A. (1997). Ten great economists: from Marx to Keynes. London: Routledge. ISBN 9780415110785. Reprinted as: Schumpeter, Joseph A. (2003). Ten great economists: from Marx to Keynes. San Diego: Simon Publications. ISBN 9781932512090. Schumpeter, Joseph A. (1954). History of economic analysis. London: Allen & Unwin. ISBN 9780415108881. Edited from a manuscript by Elizabeth Boody Schumpeter. Originally printed as: Schumpeter, Joseph (1970). Das wesen des geldes. Neuauflage, Göttingen, Germany: Vandenhoeck & Ruprecht. ISBN 9783525131213. Reprinted in 2008. Schumpeter, Joseph A. (February 1909). "On the concept of social value". The Quarterly Journal of Economics. 23 (2): 213–32. doi:10.2307/1882798. JSTOR 1882798. Schumpeter, Joseph A. (December 1927). "The explanation of the business cycle". Economica. 21 (21): 286–311. doi:10.2307/2548401. JSTOR 2548401. Schumpeter, Joseph A. (September 1928). "The instability of capitalism". The Economic Journal. 38 (151): 361–86. doi:10.2307/2224315. JSTOR 2224315. Schumpeter, Joseph A. (March 1931). "The present world depression: a tentative diagnosis". The American Economic Review, Papers and Proceedings of the Forty-third Annual Meeting of the American Economic Association. American Economic Association. 21 (1): 179–82. JSTOR 1802985. Schumpeter, Joseph A. (January 1933). "The common sense of econometrics". Econometrica. 1 (1): 5–12. doi:10.2307/1912225. JSTOR 1912225. Schumpeter, Joseph A. (March 1935). "A theorist's comment on the current business cycle". Journal of the American Statistical Association. 30 (189): 167–68. doi:10.2307/2278223. JSTOR 2278223. Schumpeter, Joseph A. (May 1935). "The analysis of economic change". The Review of Economics and Statistics. 17 (4): 2–10. doi:10.2307/1927845. JSTOR 1927845. Schumpeter, Joseph A. (May 1940). "The influence of protective tariffs on the industrial development of the United States". Proceedings of the Academy of Political Science. 19 (1): 2–7. doi:10.2307/1172508. JSTOR 1172508. Schumpeter, Joseph A. (May 1946). "The decade of the twenties". The American Economic Review, Papers and Proceedings of the Fifty-eighth Annual Meeting of the American Economic Association (The American Economy in the Interwar Period). American Economic Association. 36 (2): 1–10. JSTOR 1818192. Schumpeter, Joseph A. (November 1947). "The creative response in economic history". The Journal of Economic History. 7 (2): 149–59. doi:10.1017/s0022050700054279. JSTOR 2113338. Schumpeter, Joseph A. (1947). "Theoretical problems: theoretical problems of economic growth". The Journal of Economic History. Economic History Association. 7, Supplement: Economic Growth: A Symposium (1947): 1–9. JSTOR 2113264. Schumpeter, Joseph A. (June 1948). "There is still time to stop inflation". The Nation's Business. United States Chamber of Commerce. 6: 33–35. Archived from the original on 2014-11-29. Continued on pp. 88–91. Schumpeter, Joseph A. (March 1949). "Science and ideology". The American Economic Review. American Economic Association. 39 (2): 346–59. JSTOR 1812737. Schumpeter, Joseph A. (June 1949). "The Communist Manifesto in sociology and economics". Journal of Political Economy. 57 (3): 199–212. doi:10.1086/256806. JSTOR 1826126. Schumpeter, Joseph A. (October 1949). "English economists and the state-managed economy". Journal of Political Economy. 57 (5): 371–82. doi:10.1086/256862. JSTOR 1825618. Schumpeter, Joseph A. (May 1950). "The march into socialism". The American Economic Review, Papers and Proceedings of the Sixty-second Annual Meeting of the American Economic Association. American Economic Association. 40 (2): 446–56. JSTOR 1818062. Schumpeter, Joseph A. (May 1951). "Review of the troops (a chapter from the history of economic analysis)". The Quarterly Journal of Economics. 65 (2): 149–80. doi:10.2307/1879531. JSTOR 1879531. Schumpeter, Joseph A. (September 1982). "The "crisis" in economics – fifty years ago". Journal of Economic Literature. American Economic Association. 20 (3): 1049–59. JSTOR 2724411. Schumpeter, Joseph A. (June 1983). "American institutions and economic progress". Zeitschrift für die Gesamte Staatswissenschaft. Mohr Siebeck. 139 (2): 191–96. JSTOR 40750589. Schumpeter, Joseph A.; Boody Schumpeter, Elizabeth (September 1988). "Schumpeter on the disintegration of the bourgeois family". Population and Development Review. 14 (3): 499–506. doi:10.2307/1972201. JSTOR 1972201. Schumpeter, Joseph A. (December 1984). "The meaning of rationality in the social sciences". Zeitschrift für die Gesamte Staatswissenschaft. Mohr Siebeck. 140 (4): 577–93. JSTOR 40750743. Schumpeter, Joseph A. (author); Swedberg, Richard (introduction) (Fall 1991). "Money and currency". Social Research. The New School. 58 (3): 499–543. JSTOR 40970658. Schumpeter, Joseph A. (author); Muller, Jerry Z. (translator) (March 2003). "How does one study social science?". Society. 40 (3): 57–63. doi:10.1007/s12115-003-1039-3. Translated from a speech given in German by Schumpeter, Wie studiert man Sozialwissenschaft. Schumpeter, Joseph A.; Cole, A. H.; Mason, E. S. (May 1941). "Frank William Taussig". The Quarterly Journal of Economics. 55 (3): 337–63. doi:10.2307/1885636. JSTOR 1885636. Schumpeter, Joseph A. (September 1946). "John Maynard Keynes 1883–1946". The American Economic Review. American Economic Association. 36 (4): 495–518. JSTOR 1801721. Schumpeter, Joseph A. (May 1949). "Vilfredo Pareto (1848–1923)". The Quarterly Journal of Economics. 63 (2): 147–73. doi:10.2307/1883096. JSTOR 188309. Schumpeter, Joseph A. (February 1950). "Wesley Clair Mitchell (1874–1948)". The Quarterly Journal of Economics. 64 (1): 139–55. doi:10.2307/1881963. JSTOR 1881963. Schumpeter, Joseph A. (July 1948). "Irving Fisher's Econometrics". Econometrica. 16 (3): 219–31. doi:10.2307/1907276. JSTOR 1907276. Schumpeter, Joseph A. (1927). "The economic problem by R. G. Hawtrey". Weltwirtschaftliches Archiv (Review of World Economics). Springer. 26 (1): 131–133. JSTOR 40416594. Schumpeter, Joseph A. (November 1930). "Mitchell's: Business cycles". The Quarterly Journal of Economics. 45 (1): 150–72. doi:10.2307/1882530. JSTOR 1882530. Schumpeter, Joseph A. (December 1933). "Essays in biography by J. M. Keynes". The Economic Journal. 43 (172): 652–57. doi:10.2307/2224509. JSTOR 2224509. Schumpeter, Joseph A.; Nichol, A. J. (April 1934). "Review of Robinson's Economics of imperfect competition". Journal of Political Economy. 42 (2): 249–59. doi:10.1086/254595. JSTOR 1823265. Schumpeter, Joseph A. (December 1936). "Review of Keynes's General Theory". Journal of the American Statistical Association. 31 (196): 757–820. doi:10.1080/01621459.1936.10502311. Schumpeter, Joseph A. (June 1941). "Alfred Marshall's Principles: a semi-centennial appraisal". The American Economic Review. American Economic Association. 31 (2): 236–48. JSTOR 356. Schumpeter, Joseph A. (March 1944). "Reflections on the revolution of our time by Harold J. Laski". The American Economic Review. American Economic Association. 34 (1.1): 161–64. JSTOR 1813741. ^ Tobin, James (1986). "James Tobin". In Breit, William; Spencer, Roger W. (eds.). Lives of the Laureates, Seven Nobel Economists. Cambridge, Massachusetts, London, England: The MIT Press. Archived from the original on August 26, 2003. ^ Rachel McCulloch. "Interview with Anne Carter". ^ "Joseph Alois Schumpeter: Biography". Concise Encyclopedia of Economics (2nd ed.). Econlib.org Liberty Fund. 2008. Retrieved 2017-06-18. ^ Stone, Brad; Vance, Ashlee (January 25, 2009). "$200 Laptops Break a Business Model". New York Times. Retrieved 2010-09-21. Indeed, Silicon Valley may be one of the few places where businesses are still aware of the ideas of Josephine Schumpeter, an economist from Austria who wrote about business cycles during the first half of the last century. He said the lifeblood of capitalism was 'creative destruction.' Companies rising and falling would unleash innovation and in the end make the economy stronger. ^ Schumpeter's Diary as quoted in "Prophet of Innovation" by Thomas McCraw, p. 4. ^ a b c Robert Loring Allen (1991). Opening Doors: the Life and Work of Joseph Schumpeter: Europe (Volume 1). ASIN B00ZY8X8D4. ^ Reisman, David A. (2004). Schumpeter's Market: Enterprise and Evolution. Cheltenham: Edward Elgar Publishing. p. 4. ^ Shionoya, Yuichi (2007). Schumpeter and the Idea of Social Science: A Metatheoretical Study. Cambridge: Cambridge University Press. p. 14. ^ Seidl, Christian (1994). "The Bauer-Schumpeter Controversy on Socialisation". History of Economic Ideas. Accademia Editoriale. 2 (2): 54–67. JSTOR 23722217. ^ Allen, Robert Loring (1991). Opening Doors: The Life and Work of Joseph Schumpeter. Transaction. pp. 186–89. ISBN 9781412815611. ^ McCraw, Prophet of Innovation, pp. 231–32. ^ McCraw, Prophet of Innovation, pp. 210–17. ^ McCraw, pp. 273–78. 306–11. ^ McCraw p. 347 et seq. ^ PG Michaelides, The Influence of the German Historical School on Schumpeter, 17th International Conference of the European Association for. Evolutionary Political Economy, Bremen/Germany, November 2005. ^ Michaelides, Panayotis G. (2009). "Joseph Schumpeter and the German Historical School". Cambridge Journal of Economics. 33 (3): 495–516. CiteSeerX 10.1.1.903.6952. doi:10.1093/cje/ben052. ^ (Freeman, 2009; p. 126) in Techno-economic paradigms: essays in honor of Carlota Perez. Edited by Wolfgang Drechsler, Erik Reinert, Rainer Kattel. ^ Schumpeter, Joseph (1954). History of Economic Analysis. London: George Allen and Unwin. ^ "Phases of the Marginalist Revolution". HET. Archived from the original on 2013-05-26. Retrieved 2015-05-09. ^ Timberlake, Richard (August 2005). "Gold Standards and the Real Bills Doctrine in U.S. Monetary Policy" (PDF). Econ Journal Watch. Archived from the original (PDF) on 2005-09-10. Retrieved 2010-09-21. ^ Recent research suggests that the Kuznets swing could be regarded as the third harmonic of the Kondratiev wave – see Korotayev, Andrey V., & Tsirel, Sergey V. A Spectral Analysis of World GDP Dynamics: Kondratieff Waves, Kuznets Swings, Juglar and Kitchin Cycles in Global Economic Development, and the 2008–2009 Economic Crisis. Structure and Dynamics. 2010. Vol.4. #1. pp. 3–57. ^ John Medearis, "Schumpeter, the New Deal, and Democracy", The American Political Science Review, 1997. ^ Schumpeter, Joseph (1942). Capitalism, Socialism, and Democracy (1st ed.). Harper and Brothers. p. 252. ^ Fontana, Roberto; et al. (2012). "Schumpeterian patterns of innovation and the sources of breakthrough inventions: Evidence from a Data-Set of R&D Awards" (PDF). School of Economics and Management TECHNICAL UNIVERSITY OF LISBON Department of Economics. WP 24/2012/DE/UECE WORKING PAPERS ISSN Nº 0874-4548: 2–37. ^ Schumpeter, J. A. (1947). "The Creative Response in Economic History". Journal of Economic History. 7 (2): 149–59. doi:10.1017/s0022050700054279. ^ Schumpeter, Joseph (1942). Capitalism, Socialism and Democracy. New York: Harper and Roe Publishers. p. 82. ^ Rosenberg, Nathan. "Technological Innovation and Long Waves." In Exploring the Black Box: Technology, Economics, and History, 62–84. Cambridge, UK: Cambridge University Press, 1994. ^ Mansfield, Edwin (May 1983). "Long Waves and Technological Innovation". The American Economic Review. 73 (2): 141–45. JSTOR 1816829. ^ Geoffrey Hawthorn, "Schumpeter the Superior"
^ "Joseph A. Schumpeter: His Life and Work" by Richard Swedberg, page 1894. ^ Giersch, H. (May 1984). "The Age of Schumpeter". The American Economic Review. American Economic Association. 74 (2): 103–09. JSTOR 1816338. ^ Foster, John Bellamy (May 2008). "Sweezy in Perspective". Monthly Review. Retrieved 2010-09-21. ^ Thoma, Mark (2007-05-17). "Robert Solow on Joseph Schumpeter". Economistsview.typepad.com. Retrieved 2010-09-21. ^ "Opening ceremony: Schumpeter School of Business and Economics". University of Wuppertal. 8 July 2011. Archived from the original on 1 October 2011. ^ "Taking Flight". The Economist. 17 September 2009. ^ Schumpeter (17 September 2009). "Taking flight". The Economist. Economist.com. Retrieved 30 August 2012. Carayannis, E. G.; Ziemnowicz, C., eds. (2007). Rediscovering Schumpeter. Palgrave Macmillan. ISBN 978-1-4039-4241-8. Cheung, Edward "Baby Boomers, Generation X and Social Cycles" "The latest findings on Schumpeter's Creative Destruction." Dahms, Harry (1995). "From Creative Action to the Social Rationalization of the Economy: Joseph A. Schumpeter's Social Theory". Sociological Theory. 13 (1): 1–13. doi:10.2307/202001. JSTOR 202001. Davis, Horace B (Winter 1960). "Schumpeter as Sociologist". Science and Society. 24 (1): 13–35. JSTOR 40400680. Harris, Seymour E., ed. (1951). Schumpeter: Social Scientist. Harvard University Press. ISBN 978-0-8369-1138-1. Heilbroner, Robert (2000) . "Chapter 10: The Contradictions of Joseph Schumpeter". The Worldly Philosophers (seventh ed.). London: Penguin Books. ISBN 978-0-140-29006-6. .
Humphrey, Thomas M. (2008). "Schumpeter, Joseph (1883–1950)". In Hamowy, Ronald (ed.). Schumpeter, Joseph (1893–1950). The Encyclopedia of Libertarianism. Thousand Oaks, CA: SAGE; Cato Institute. pp. 452–55. doi:10.4135/9781412965811.n276. ISBN 978-1-4129-6580-4. LCCN 2008009151. OCLC 750831024. McCraw, Thomas K. (2007). Prophet of Innovation: Joseph Schumpeter and Creative Destruction. Belknap Press. ISBN 978-0-674-02523-3. Michaelides, Panayotis; Milios, John (2005). "Did Hilferding Influence Schumpeter?" (PDF). History of Economics Review. 41 (Winter): 98–125. doi:10.1080/18386318.2005.11681205. Retrieved 2 July 2010. Robbins, L. C. (1955). "Schumpeter's History of Economic Analysis". Quarterly Journal of Economics. 69 (1): 1–22. doi:10.2307/1884847. JSTOR 1884847. Swedberg, Richard (1992). Schumpeter: A Biography. Princeton University Press. ISBN 978-0-691-04296-1. Wikimedia Commons has media related to Joseph Schumpeter. Joseph Alois Schumpeter (1893–1950). The Concise Encyclopedia of Economics. Library of Economics and Liberty (2nd ed.). Liberty Fund. 2008. Andersen, Esben Sloth. "Review of Schumpeter: A Biography" (PDF). Journal of Economic Literature. Archived from the original (PDF) on 2009-03-27. Retrieved 2006-05-19. Retrieved on December 4, 2007. Kilcullen, John. "Reading Guide 10: Schumpeter, Capitalism, Socialism and Democracy". Macquarie University. Archived from the original on 2012-10-25. Retrieved on December 4, 2007. "Joseph A. Schumpeter". HET. Archived from the original on 2013-05-17. Retrieved on April 29, 2013. Drucker, Peter. "Modern Prophets: Schumpeter and Keynes?". Retrieved on December 4, 2007. DeLong, J. Bradford. "Creative Destruction's Reconstruction: Joseph Schumpeter Revisited". The Chronicle of Higher Education. Retrieved on December 4, 2007. Schumpeter, Joseph Alois. "Schumpeter's Business Cycles: A Theoretical, Historical, And Statistical Analysis of the Capitalist Process". Business History Review. Archived from the original on 2016-10-09. Harvard University Archives. "Papers of Joseph Alois Schumpeter : an inventory". "Web Joseph Alois Schumpeter in Memoriam". This page was last edited on 23 April 2019, at 16:26 (UTC).